It’s difficult to believe that there are only five or so games left until finals. Despite a few hiccups along the way, the Club has achieved a great deal, including nurturing a love of football in our community, supporting players of all ages through a diverse range of playing option, and continually exploring ways to support and educate our coaches. 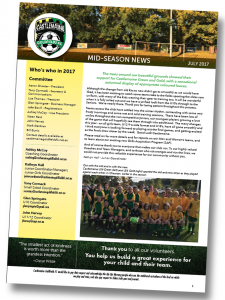 Have a read of our newsletter and keep abreast of what is happening around the club.